This page shows information about your VPOP3 installation. Section 1 shows the version number of VPOP3 and when it was built. (Note version numbers are not normal numbers, so 'version 6.20' is not the same as 'version 6.2'). Section 2 shows your licence information if any. 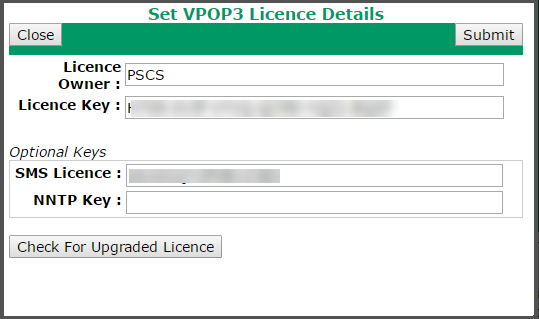 •Licenced To and Maximum Users shows your main VPOP3 licence details - who the software is licenced to and for how many users. This is all that is needed for VPOP3 to run. •Spamfilter (optional) - this indicates whether you have purchased a spam filter update subscription, and when it expires. The spam filter will continue to work after this date, but will not download updated definitions. •VPOP3 Antivirus (optional) - this indicates whether you have purchased a VPOP3 Antivirus subscription, and when it expires. The virus scanner will stop working after this date. •Licence Activation - this indicates whether VPOP3 has managed to verify your licence with our online activation servers, and, if so, when your Software Maintenance expires. See below for further information. All the 'optional' licences above are optional, so if you do not have that licence, it does not mean there is a problem, just that you have not purchased that option. 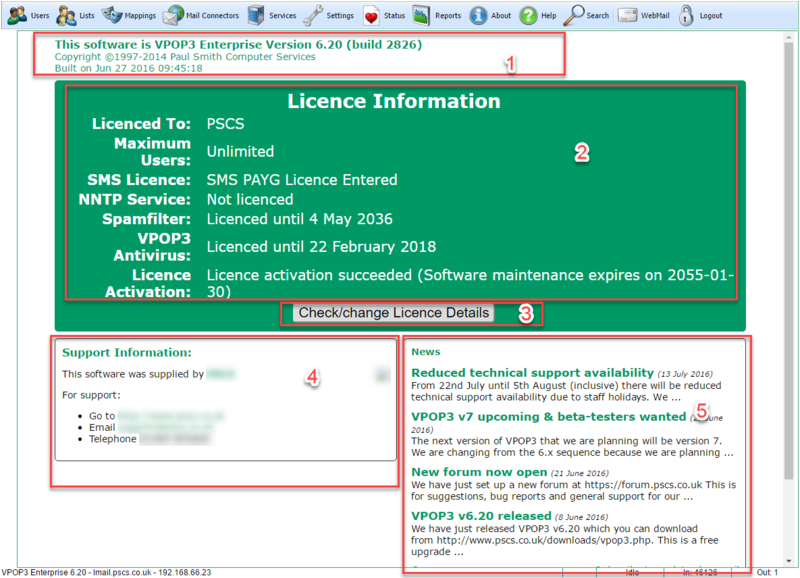 Section 3 shows the button to view or change the VPOP3 licence details. 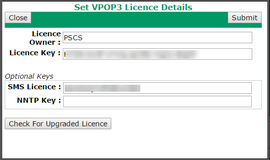 The Licence Owner and Licence Key fields make up your VPOP3 licence details. You need to enter both of those exactly as provided by us. Letter case, punctuation, spaces etc are all important. You can also enter the optional keys for the SMS PAYG service and NNTP service options here. If you have not purchased these options you can leave the boxes blank. The Check for Upgraded Licence button lets VPOP3 search online for an upgraded licence for your installation. Note that the Spam Filter and VPOP3 Antivirus subscriptions do not have licence keys. VPOP3 checks for updates using the main VPOP3 licence key which is validated online for the relevant subscription. Section 4 shows support information. It should show who you purchased the software from, and support contact information for that provider. Note that the presence of contact information here does not mean you have free access to support. It may be that your provider needs you to pay for support. Section 5 shows news about VPOP3. This is taken from a news feed from the VPOP3 blog. Because we release a new version of VPOP3 every few months, we do not issue new licence keys for each version, otherwise it would get complex for us and users to manage. Instead, the same licence key is used, but has a 'maintenance expiry' date associated with it on our servers. When VPOP3 is installed or starts up it contacts these online servers to verify that the licence details it knows about are valid for this version of VPOP3. Once that is done, then the Licence Activation box will indicate Licence Activation Succeeded. If VPOP3 cannot contact the activation servers, it will display Licence Activation Pending and VPOP3 will continue trying for some time before giving up. VPOP3 can be used as normal during this time. For the activation to work, VPOP3 needs to be able to make outgoing HTTPS (TCP port 443) connections to the activation servers which are called activate0.pscs.co.uk, activate1.pscs.co.uk etc up to activate7.pscs.co.uk. If your VPOP3 installation does not have access to the Internet for some reason (this is rare, because email servers usually have Internet access to be most useful) then contact technical support for an alternative activation method which is less convenient but will work without Internet access.